We know there’s a fair amount of new, attractive gambling sites that, just so happens, cater to South African players, but sometimes it’s best to opt for what is proven and has a long, positive track record. Particularly, we’re referring to Casino Las Vegas as an option for South African players who want to place real money bets on quality games in ZAR. The website has been active since 1997, and carries a lot of history, although it appears as modern as the next gaming site. It runs solely on Playtech software, housing over 250 top casino games which are compatible with most used mobile devices. The brand advertises a charming welcome bonus on the homepage of doubling the first deposit up to R5,000 and adding 50 free spins on top of that. Non-stop promotions are the usual deal with Casino Las Vegas, and the site accommodates players additionally with a wide range of banking methods. The biggest advantage of an instant play gaming platform is that players can get to mobile games easy and without having to download any apps on their handheld devices. With a simple launch of a browser and typing in ‘Casino Las Vegas mobile’ you’ll be able to gain access to mobile-friendly slots, table games and live casino Playtech tables. The manufacturer of the device and the operating system are not important in 99% of the cases, for Casino Las Vegas can be played on iPhones, iPads, Samsung Galaxy devices, Nokia phones, Fire tablets and other Android-powered handsets. You’ll not face any struggles trying to find a suitable game, since they are all in HD and at full throttle. In some aspects, Casino Las Vegas succumbs to exclusivity, but for valid reasons. The brand only houses Playtech software because it is one of the best and most diverse software packages in the world. It’s that simple. Playtech is one of the main powerhouses in the business, and Casino Las Vegas brings out the best in their cooperation. The casino lobby is crowded with brilliant slot machines, from the all-time favorites like Top Gun, Jekyll and Hyde and Halloween Fortune to the latest multi-reel releases like Dirty Dancing, Age of God: God of Storms and Ice Cave. There are dozens of versions of roulette and blackjack on site, accompanied with video poker machines and casino poker. Playtech is known for its generous progressive jackpot network, so don’t miss out on any of the Age of Gods slots. If you’re not a fan of Greek mythology, you can try your luck on Beach Life or Jackpot Giant. 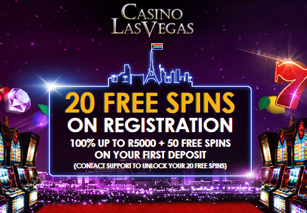 Just for regestering you will recive a no deposit bonus of 20 Free spins plus first-time depositors at Casino Las Vegas ought to prepare themselves for a fine 100% match bonus up to R5,000 and accept 50 free spins as a welcome offer. The minimal deposit amount that qualifies for the welcome bonus is R200, so if you deposit that much you’ll have R400 to start playing with. Keep in mind that the first deposit bonus comes with a 20x bonus + deposit amount rollover requirement and that players have 30 days to meet these conditions. Other than the welcoming package, the experience of being rewarded at Casino Las Vegas continues with regular daily promotions which can be claimed by all funded players, including customers from South Africa. These Vegas Daily Deals, as they are called, arrive in the recipients’ inboxes and can contain cashback offers, match deposit bonuses, free spins and more. Players who come to Casino Las Vegas and need assistance to manage their account, or some kind of clarification about any aspect of the casino’s functionality, they can rely on the helpful customer support team. ‘Got a question? We would love to help?’ is the team’s motto, and whatever the request is they will treat it with highly trained and pleasant attitude. To get in touch and make use of the around the clock customer service Casino Las Vegas members have several options. For instant assistance they can opt for live chat or telephone. There is also the possibility of using fax and email to contact casino representatives. The international phone number can be used by player from SA. As for making payments, it’s really an easy thing to do when you have so many convenient methods at your disposal. South African clients will benefit the most if they pick Visa, MasterCard, Skrill or Neteller, although the site offers a dozen other banking options for its international clientele. For even greater convenience, the site accepts several currencies, and South African Rands is one of the most used, considering the fact it’s not a major currency like Euro, for example. Deposits are instantaneous, and withdrawals may take a few days to complete, as is the case with most online casinos. What Do We Think of Casino Las Vegas as a Whole? Casino Las Vegas is a very attractive possibility for the South African community of online players, as it accepts ZAR, offers a massive range of top notch games from a leading supplier, gives a solid choice of banking methods and makes use of mobile play as well as of a desktop website. The brand’s look and feel is a virtual extension of the classic Vegas atmosphere and some of the major selling points are progressive jackpots that can make one an instant millionaire. Other than that, players can enjoy a complete suite of table games and slots without a progressive prize, make informed decisions and pick what suits them and their bankroll best. Casino Las Vegas has a little something for everyone and quite a lot for someone from South Africa who wants to use ZAR and have genuine online casino fun.